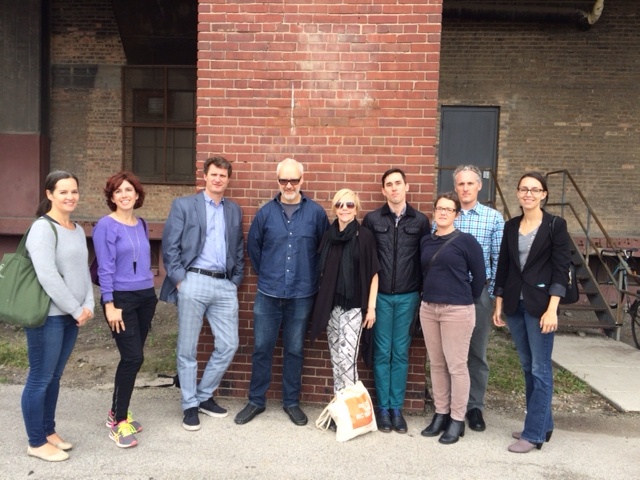 The recent Donors’ Circle trip to EXPO Chicago was inspiring and stimulating. It was quite extraordinary to get personal home tours from esteemed art collectors, private viewings of new gallery exhibitions, invitation-only after parties and all the contemporary art Chicago’s Navy Pier could handle. KMAC Donors’ Circle member Leslie Millar wrote a brief synopsis of the week-end in case you couldn’t join us. 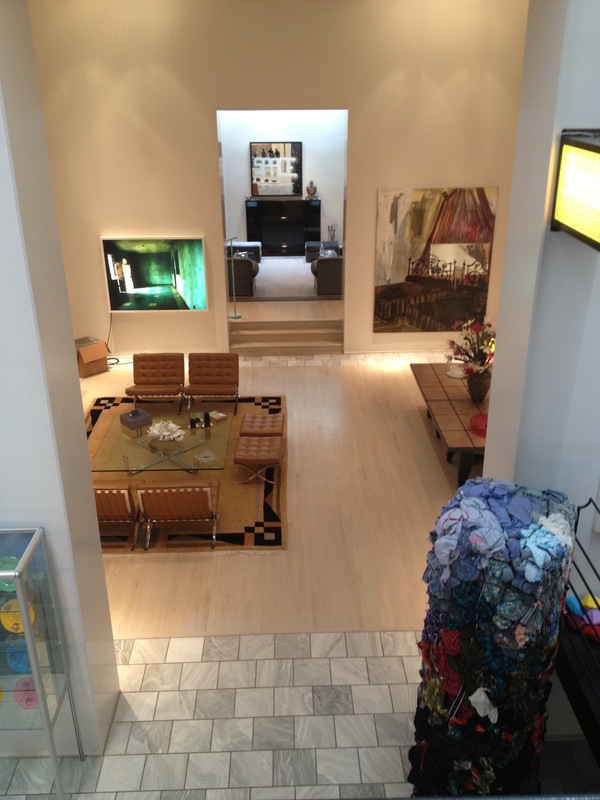 We started the morning by touring the private collection of Jack and Sandy Guthman. Their immaculately restored five-story home includes a canvas thread piece by Tom Friedman, an installation by Sarah Sze, and video by Kate Gilmore. We admired a FedEx shipping box of Walead Beshty and bundles assembled by Shinique Smith. The wide-reaching collection revolves around a strong center of photography and some Chicago artists, including painter Judy Ledgerwood. 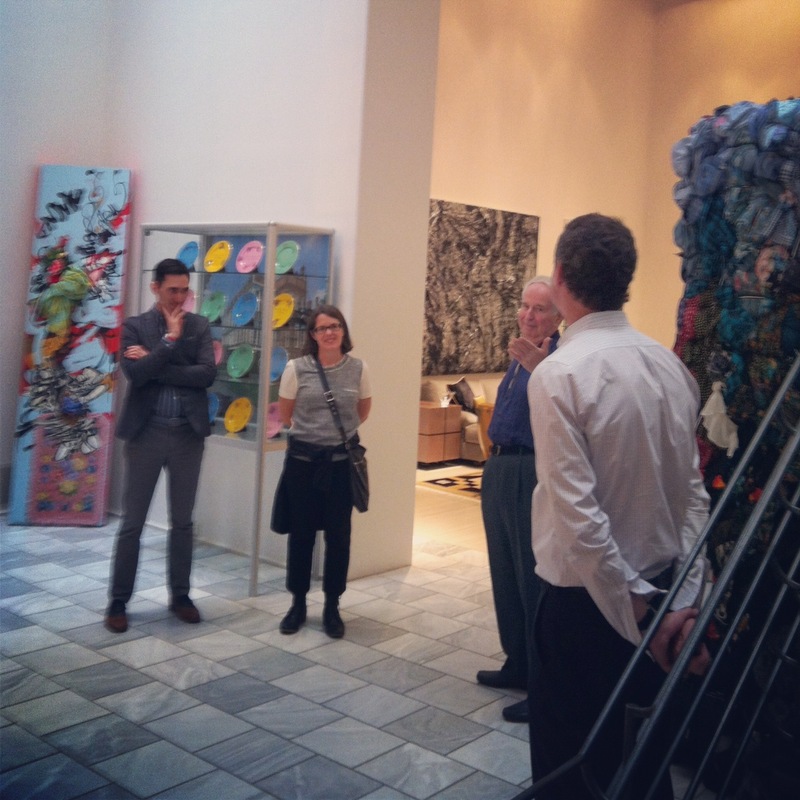 During the afternoon, we toured galleries and met with artists and curators who were buzzing about the EXPO and accompanying Gallery Weekend Chicago. 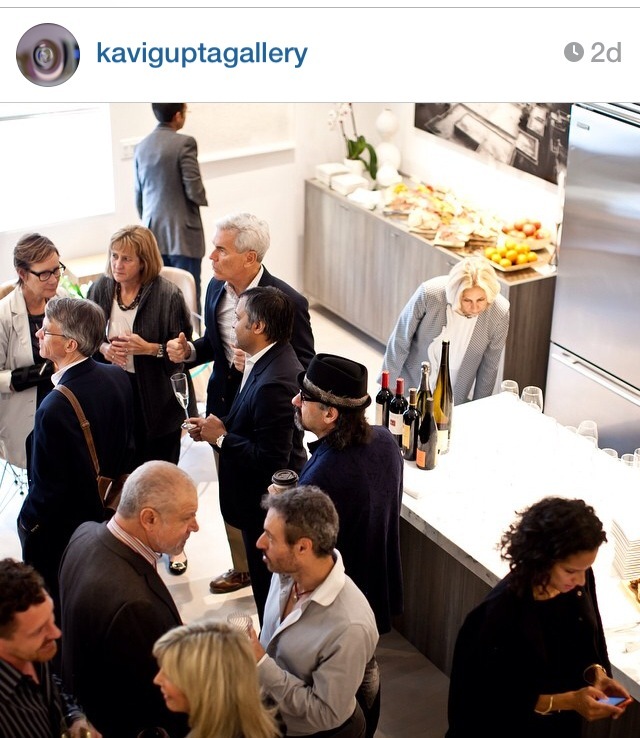 That evening the KMAC group was invited for cocktails at Kavi Gupta for the opening of Roxy Paine’s Apparatus. This diorama show offers a radical departure from the sculpture that viewers have come to associate with the artist. 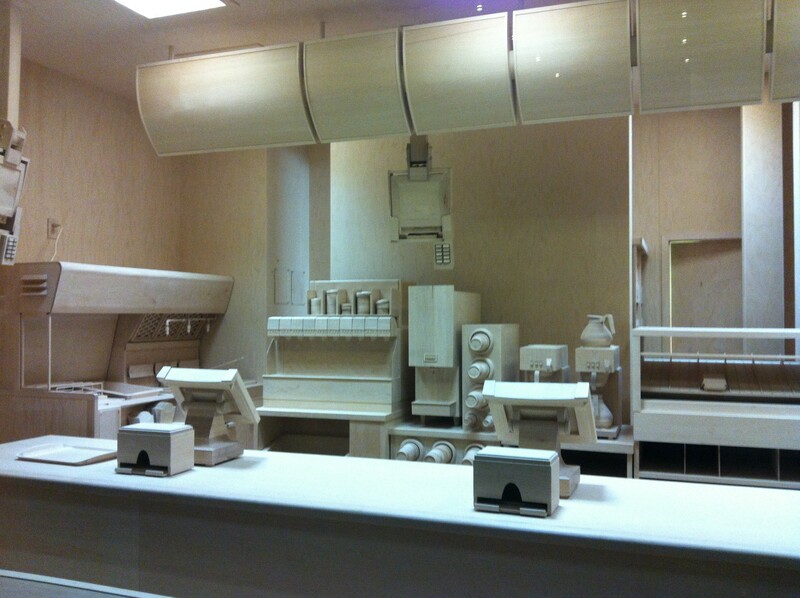 Two room-sized installations replicate, in unvarnished wood, a control room and a fast food counter, right down to the straw dispensers and fry basket. We finished the night with a raucous party at gallerist Monique Meloche’s house. The Donor’s Circle dined on a hearty breakfast on the patio at the Museum of Contemporary Art Chicago. Downstairs, we enjoyed a photo show from the museum’s collection. Upstairs, the MCA showcases a retrospective by Chicago-born cartoonist Daniel Clowes. On the third floor, an exhibition of installations called Homebodies features a walk-through Victorian house fabricated in nylon by Do Ho Suh. The Donor’s Circle took particular note of constructions and video by Chicago resident Theaster Gates, as we recently exhibited one of Gates’ shoe-shine stands at KMAC during the Storytelling as Craft. Next we visited the private Collection of Howard and Donna Stone, which centers around 60s and 70s Minimalist and Conceptualist work, including: a double-portrait wall drawing by Jim Hodges, pieces made of yarn and elastic thread by Fred Sandbach, a candy pile by Felix Gonzalez-Torres, and an installation by Sarah Sze. We spent the rest of the afternoon strolling through Chicago EXPO, on the Navy Pier viewing works by established artists like Fred Tomaselli and Leon Ferrari and site specific ampersands by emerging artist Karl Haendel. Some revelers continued on to Late Night at the Wright Auction House. We finished our Chicago weekend with a brunch at Rhona Hoffman Gallery, where we saw Spencer Finch’s color-swatch watercolor paintings and light boxes and took in Judy Ledgerwood’s dense oil paintings. 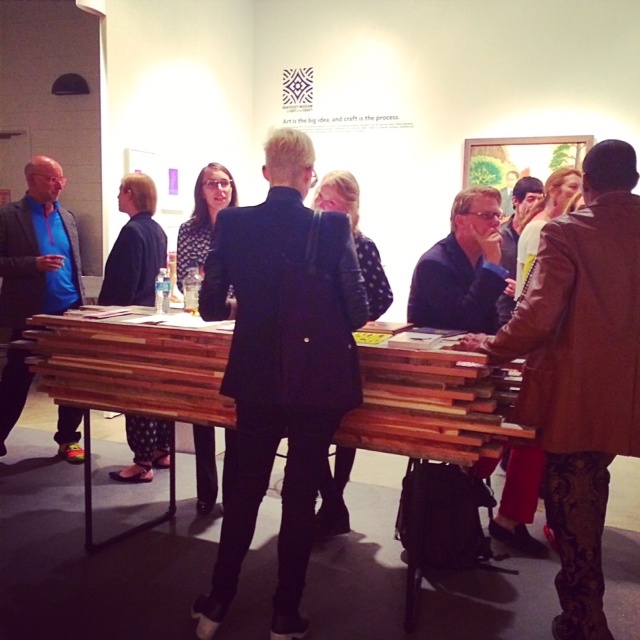 Many thanks go to the collectors, curators, and gallerists who shared their gracious hospitality. Even greater thanks to KMAC Director Aldy Milliken and Development Director Angela Hagan for their tireless efforts of organizing the trip and shepherding the members of the Donor’s Circle around the city. We hope that you will join the KMAC Donor’s Circle on another of these intellectually invigorating art outings! KMAC invited the Donor Circle to a special preview of two exhibitions that kick off the 2013 fall season, Creative Growth: Dan Miller and Judith Scott and Studio Visions. 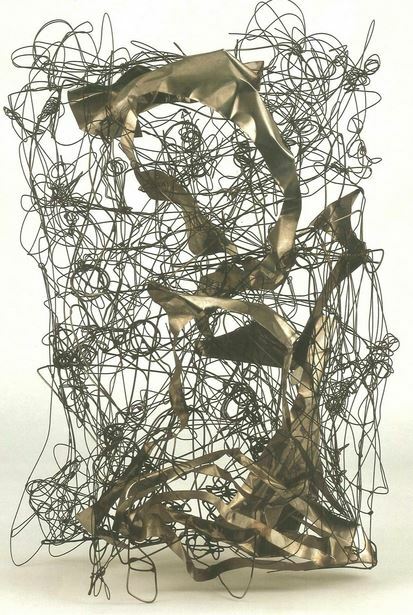 The entire show features work by artists with disabilities collected from three national art centers that offer support in exploring self-expression. Creative Growth: Dan Miller and Judith Scott curated by Matthew Higgs (White Columns NYC) brings together two artists who are closely associated with the Creative Growth Art Center in Oakland, CA. Studio Visions organized by Aldy Milliken with Krista Gregory (Visionaries + Voices) and Al Gorman (StudioWorks) brings together seven regional artists: Robert Bolubasz, Julie Baldyga, Kathleen Brannigan, Courttney Cooper, Andrew Hostick, Romando Love, and Matthew Torstrick. A few local exhibiting artists as well as the Director of StudioWorks were on hand to further dialogue about the work and answer questions about studio practice. KMAC Director, Aldy Milliken elaborated on how the show came to exhibit at the Museum. He first saw the work of Judith Scott at NADA Miami and was intrigued. After research, he found other art centers that were enabling the art making process among adults with physical and developmental disabilities including a few right in the region. The documentary, Outsider: The Life and Art of Judith Scott by Betsy Bayha is also a part of the exhibition.